 Tankvagn typ DB "VTG Hamburg"
Tankvagn typ DB "VTG Hamburg"
By buying this product you can collect up to 383 bonuspoints. Tankvagn typ DB 'VTG Hamburg', längd över buffertar 14,6 cm, epok III. 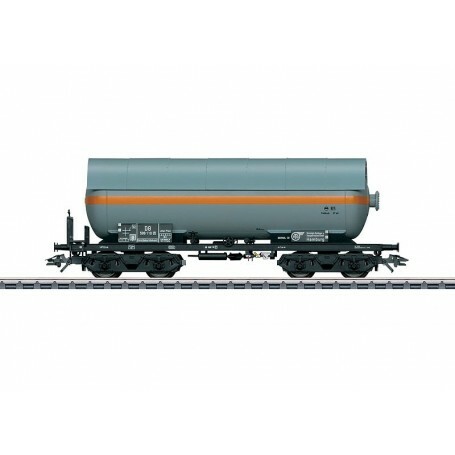 'Pressurized Gas Tank Cars' are identified in Europe as hazardous materials tank cars with an orange stripe around the sides. This stripe is located halfway up the tank and has a standard width of approximately 30 cm / 12 inches. In addition, the tank car is authentically lettered and replaces with its own car number existing unit train sets. Prototype: Pressurized gas tank car, used on the German Federal Railroad (DB), privately owned car painted and lettered for VTG United Tank Farm and Transportation, Inc., Hamburg, Germany. Model: The car has a detailed, partially open frame. The side sills are 'U' profile shapes with cable hooks. The trucks are type Minden-Dorstfeld. The tank has a heat shield. The brakeman's platform is separately applied. Length over the buffers 14.6 cm / 5-3/4'. DC wheel set E700580.